Even though you might not connect bright summer nights with winter darkness and Christmas trees, the summer weather has been of great importance to the way the merry Christmas trees stand out. This year, the trees will be more beautiful than last year, the organization Danish Christmas tree Association says. The sales-ready trees have done the drought astonishingly well. They have a darker green color than they usually have. Denmark is Europe’s largest exporter of Christmas trees, and sold 10 million trees around the world in 2017. Germany accounts for 49% of the Danish exports of Christmas trees, and is the largest purchaser of Christmas trees from Denmark. Thereafter, France, Great Britain, Sweden, Czech Republic, Norway, Poland, Austria, Switzerland and the Netherlands will account for 40% of the Danish Christmas trees. Among the more exotic export markets are Hong Kong, Singapore and the United Arab Emirates. One and a half a million Danish trees are sold in Denmark. 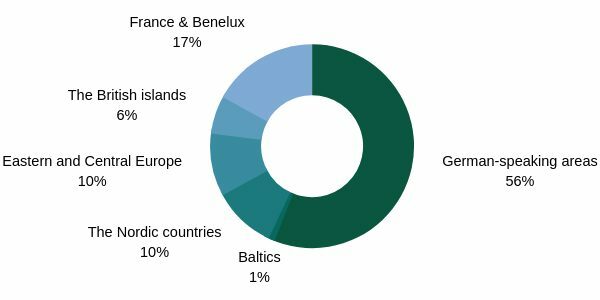 Our Nordic neighbors accounts for 10% of total exports with Sweden as the biggest buyer followed by Norway, Iceland and Finland. Denmark also supplies Christmas trees to Greenland and the Faroe Islands. In 2017, Denmark exported Christmas trees and greenery for a total of almost 1 billion DKK. Of the almost 1 billion DKK, Christmas trees account for just under 0.8 billion DKK. The greenery brings about 0.2 billion DKK. The first decorated Christmas tree did not appear until 1510 in Riga. Here, a plate has been deposited in the central place of the city regarding the celebration of the 500th anniversary of the Christmas tree’s origins (in 2010). The first known Danish Christmas tree was lit on Holsteinborg Gods in South Zealand in 1808. The tradition of Christmas tree had come to Denmark from Germany, and families related to this German tradition were therefore among the first to take the tradition.